Will the Pats be using a 4-3 or a 3-4? Bill Belichick bristles at the desire to label. Jene Bramel explains why. Photo by Sean O'Brien. 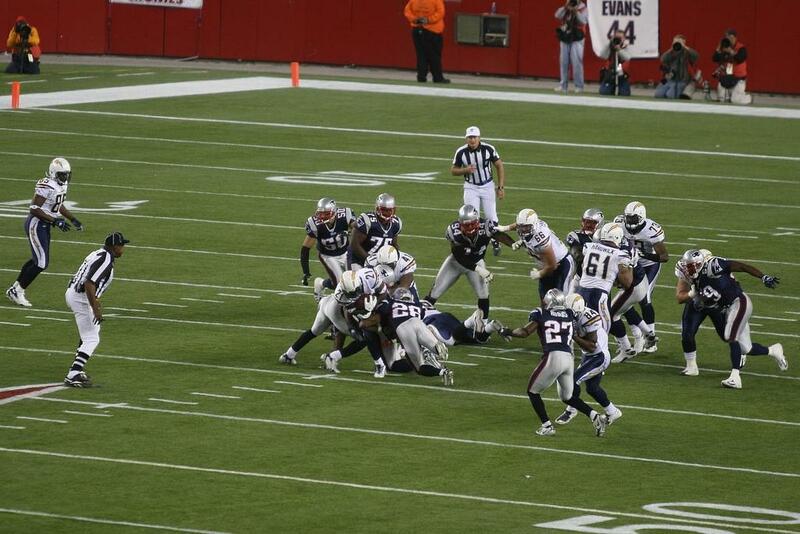 Much was made of the New England Patriots’ defensive scheme this preseason. The signing of Albert Haynesworth and the release of Ty Warren prompted lots of discussion about whether the Pats would move away from what has been their traditional base 3-4 front in recent seasons. Matt and I even talked about it during a conversation for the blog last month. After the Patriots began aligning in a four-man front early in the preseason, Belichick was asked about the switch. Was his team becoming a 4-3 defense? In true Belichick form, he bristled at the question. Some of Belichick’s response is just him being coy, but I think there’s an important point bubbling under the surface. Looking at the front seven alignment above you can clearly see why Belichick resisted the premise of labeling his defense. By convention, defenses tend to be defined by the number of down defensive linemen. However, looking at the front seven alignment above, you can clearly see why Belichick resisted the premise. Depending on whether one or both players on the edges of the front place their hand on the ground, the defense above could be correctly (and conventionally) labeled a 3-4, a 4-3, or a 5-2, but still essentially the same scheme with the same responsibilities across the front. You could do the same for other base defensive fronts, too. Belichick is poking the bear a bit with his “media fabrication” comment, but I think his suggestion that the general public is dependent on defining defensive fronts as either a 3-4, 4-3 is absolutely true. “You play different fronts, you play different spacing, and you teach the techniques of your defense. That is what consistent, techniques that are taught in different defensive systems, whether those teams go from three-man line to a four-man line, or a four-man line to an odd spacing line, or overs to unders, or unders to overs, or over-wides, whatever you want to call it. They will continue to play the same fundamental techniques as they’ve been teaching for the entire year, for the most part. It’s not the number of appendages on the turf that defines a defense for Belichick. It’s the assignments and responsibilities each player has within the front. It’s tweaking the alignment, but not the techniques, to make the best use of the personnel you have. Belichick’s responses remind me of an adage I’ve heard from coaches with similar opinions, “Play defense, not defenses.” Regardless of the front or fronts you choose to play or what terms you use to define them, it’s the execution of its fundamentals that determines success. That’s not to say that using the 3-4 or 4-3 convention is useless. But, take note of what one of the best defensive minds in the game believes. Don’t limit yourself to counting the number of defensive linemen when watching a game on Sunday. Consider how the defense might be using its personnel to attack gaps or disguise coverage. The television cameras will follow the ball, but there’s much to be learned from peeking over to the defensive side of the ball. Not all 4-3 and 3-4 fronts are alike. Some 3-4 fronts are more like 4-3 fronts than the 3-4 fronts of yesteryear. And it’s fun to channel your own inner wannabee Belichick while watching the game on Sundays. The right labels are there in the playbook. Joker, Bandit, Rush, Rover. None specifically suggest LB or DE. If you’re talking about fantasy, that’s another discussion. As soon as a consensus was reached there, however, the never-ending cycle of the NFL would probably trend in a new direction and make that designation obsolete. Great article. I’d love to see an article/conversation about how the evolution of stunting defensive linemen has changed scouting and drafting. I would think that would be an interesting topic that scouts would definitely have some interesting insights/comments about. Chris Brown has a great piece up about this concept at Grantland (http://www.grantland.com/story/_/id/7537225/bill-belichick-vince-wilfork-new-england-patriots-defense) that Jene expertly touched upon here in September.